The concept behind Picnic Grounds formed when I was quite literally having a picnic in a park. In college, you could find me at one of two places: in a cafe with my laptop or in a park with the sky. Although I adored both, what led me to the cafe more often than the park was the need to be productive via good coffee and good wifi. This was my first taste of the hustle and bustle of real life; a reality that allows little time for the outdoors. Quick trips to the park helped satisfy my cravings for fresh air, but then off to the enclosed walls of a cafe, library, or bedroom I’d go. I realized that I just wanted the ability to do all the things I would in a normal cafe, only outside. I was done sacrificing my time in nature for internet connection. So I decided to create a place that offers both. Eventually, Picnic Grounds will be an outdoor cafe situated on a lot of land full of shade trees and grass. A spot where we can indulge in great coffee, check off items on our to-do lists, and soak in some vitamin D.
The intention is to make the outdoors an effortless addition to our daily lives, without sacrifice. 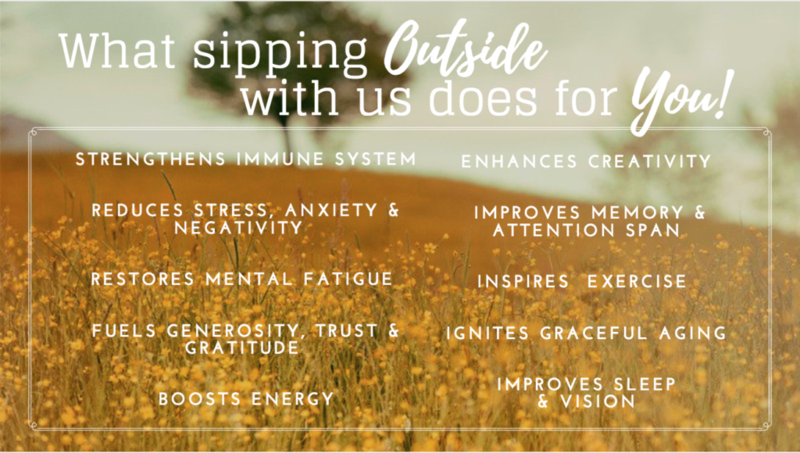 Scientists have discovered that spending some time outside on a regular basis results in the above benefits + more!